This project was funded in FY2012 through National Fish Habitat Action Plan funding. 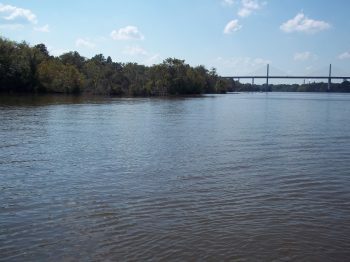 A lack of clean, hard substrate has been noted as a limiting factor for the restoration of many anadromous species in the James River. The loss of this ideal spawning habitat is due to dredging and excess sediment entering the river from erosion. This project, led by the James River Association, promoted the population of Atlantic sturgeon (Acipenser oxyrinchus oxyrinchus) and other anadromous fishes of the Chesapeake Bay through the restoration of spawning and nursery habitat. Text and photos provided by the James River Association.